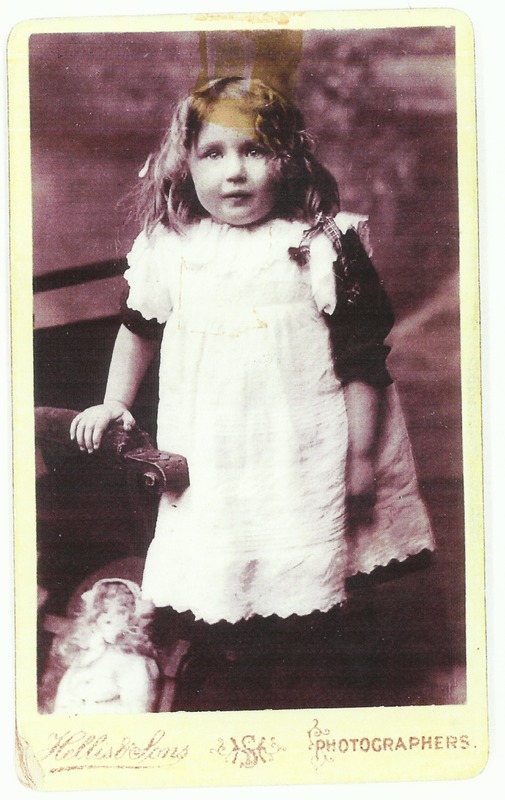 I have been looking through my collection of old postcards and greetings cards and I found this lovely one that was sent 98 years ago! 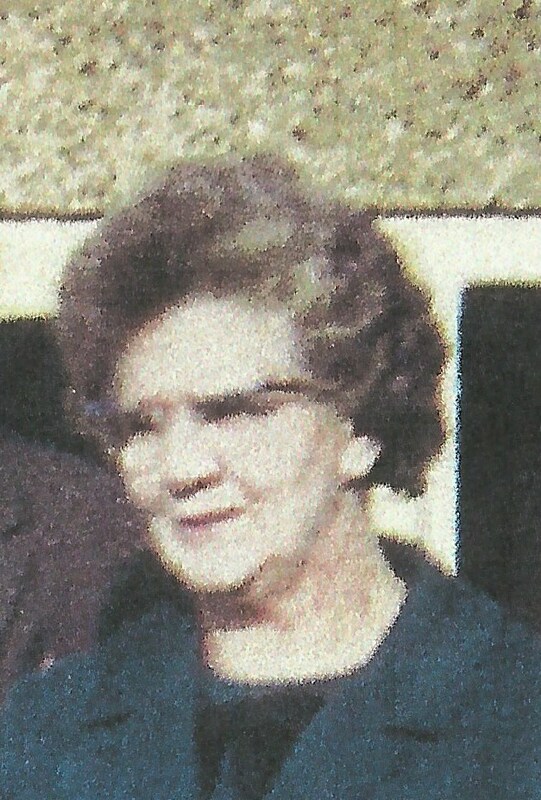 It was sent to Miss Gertie Smedley at Barrow Moor Farm, Hulland, Derby. 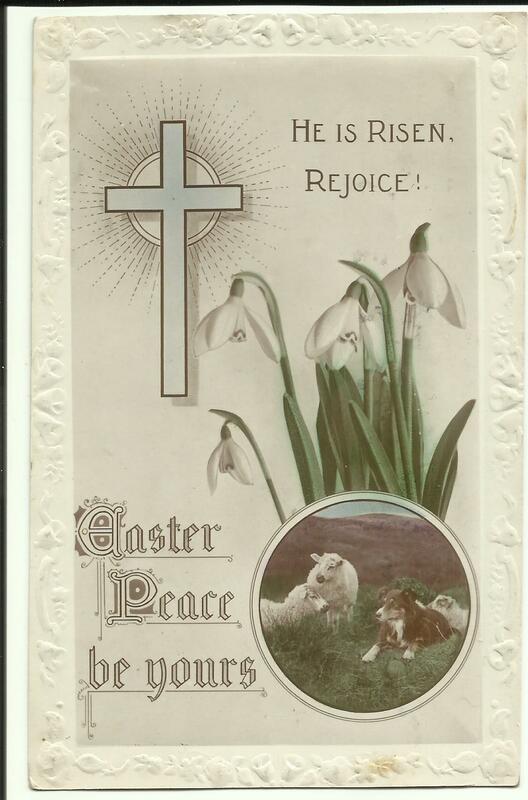 Not even a ‘Happy Easter’ to go with the beautiful card! Although given the date I suppose celebrating Easter would have been low on people’s priorities. The postage stamp is a halfpenny one, with King George V on it. I don’t know who the correspondents are, I can’t remember where I bought the card. I just really love the image of the lily of the valley flowers, the sheep and sheepdog. 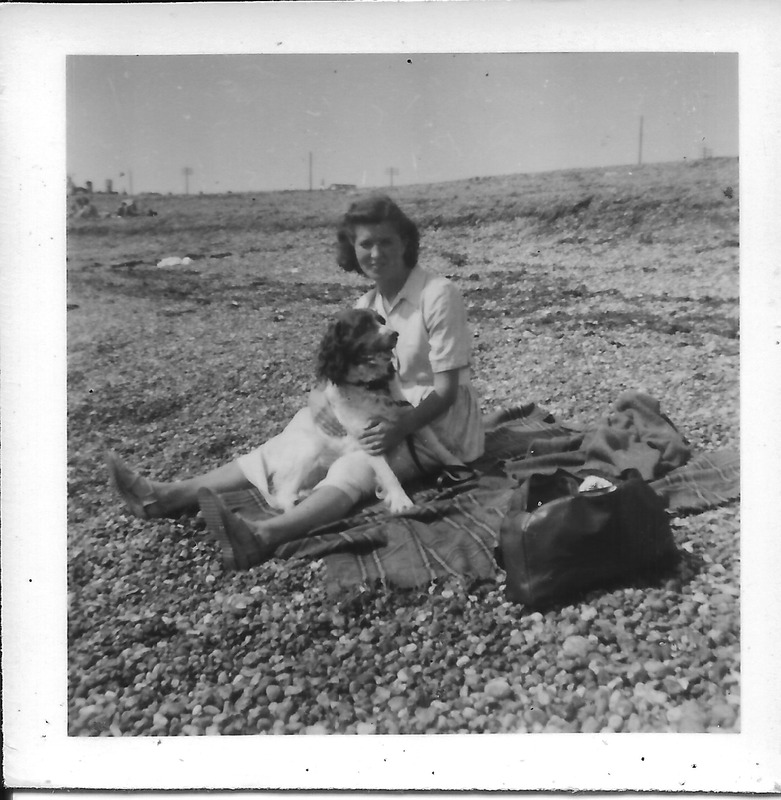 It has been noted before that my mother, Enid May Howells bore a close resemblance to her mother, Queenie Cockett. 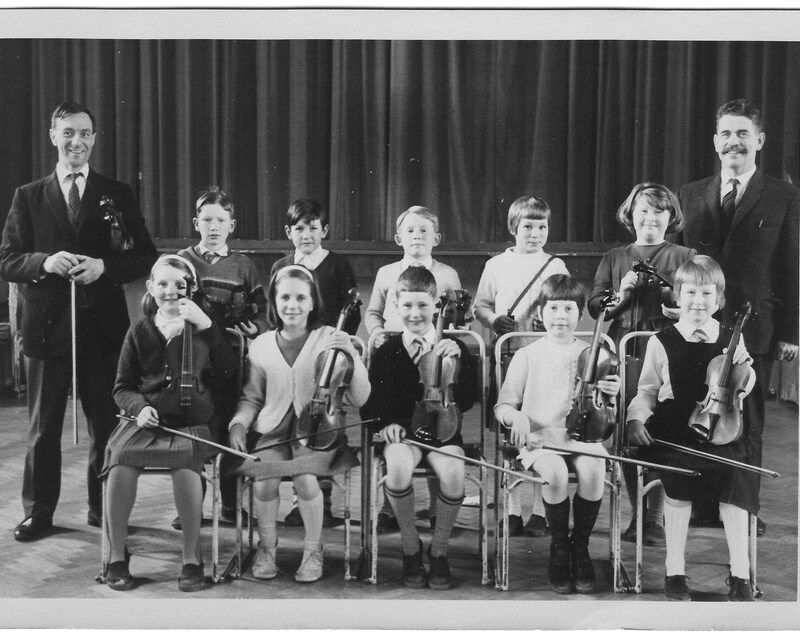 Here are another couple of photographs that show the continuing similarity as they grew up. 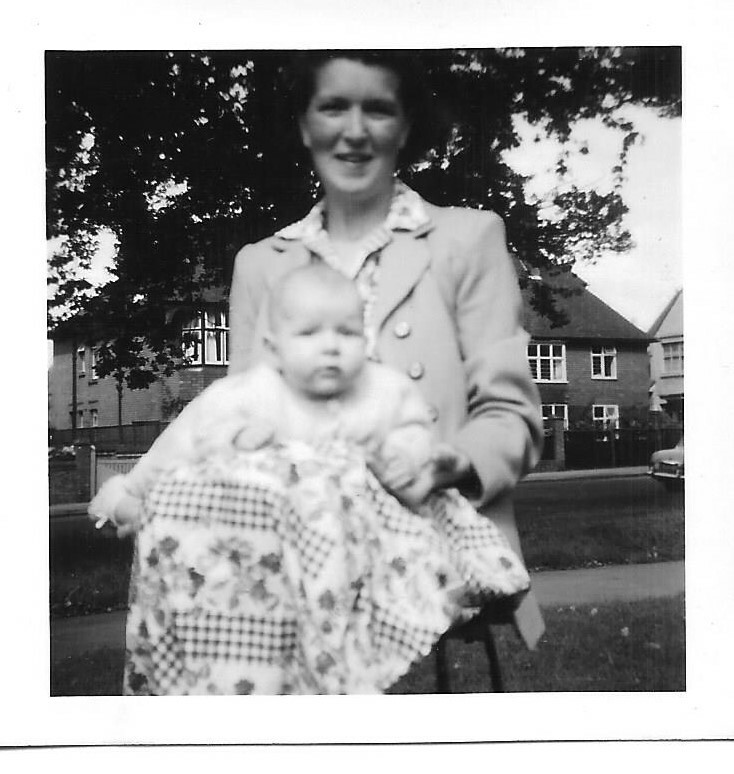 I have been looking through a book of old family photographs and found some of me aged three months. At first I thought this would have been August 1958. But I’m wondering if it might have been a few days earlier, at the end of July of that year. It has to be said they are not the best photos I’ve ever seen! The focus seems to be set on the background, leaving me and my parents a mere blur in the foreground. My parents look very smart for a trip to the park, and it when I saw the tennis game in the last photograph that I wondered which park it was. The only one I can think of that looks like this is St Ann’s Wells Park in Hove. I know this was the park nearest to our house, and we went there a lot when I was small. A blurry Mum and me with some very clear shots of the houses in the background! An even clearer shot of the houses in the background, with Dad and me! 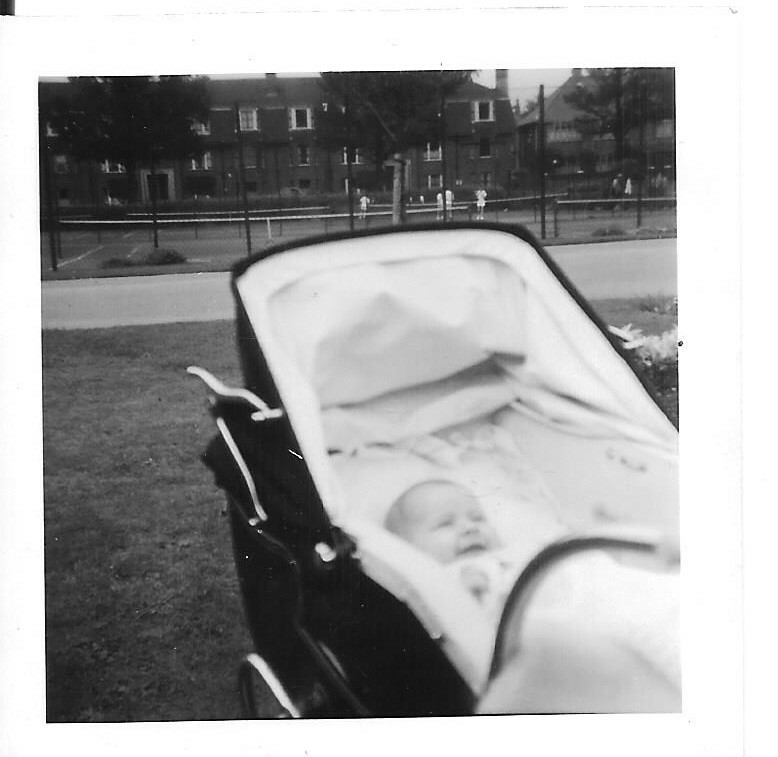 Me in my pram, although the photographer seems to be more interested in capturing the game of tennis going on behind! 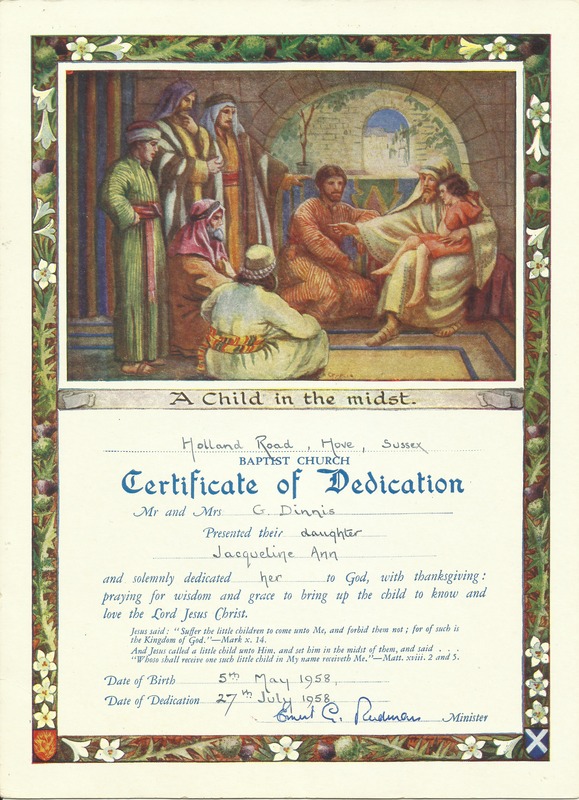 I looked back at my Dedication Certificate to check the date and note it was on the 27th of July 1958. 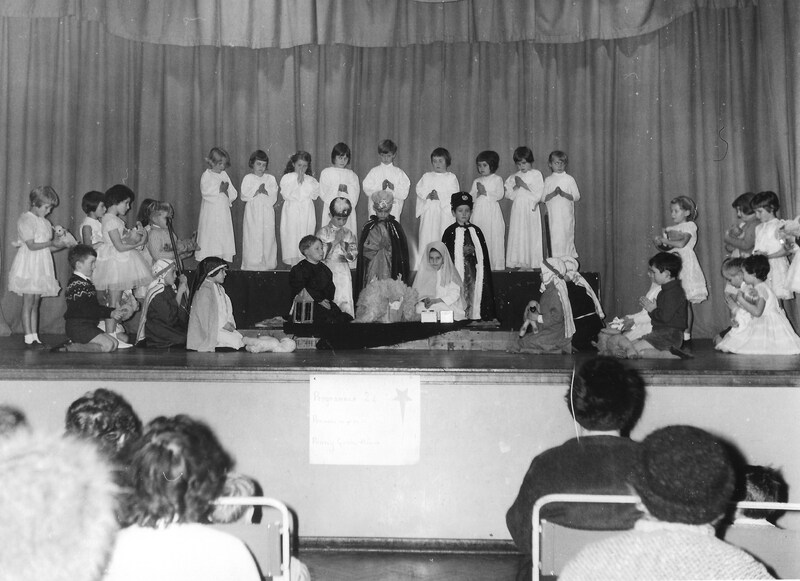 It was held at Holland Road Baptist Church, Hove which is within easy walking distance of St Ann’s Wells Park. So I wonder if the photographs were taken on this day? 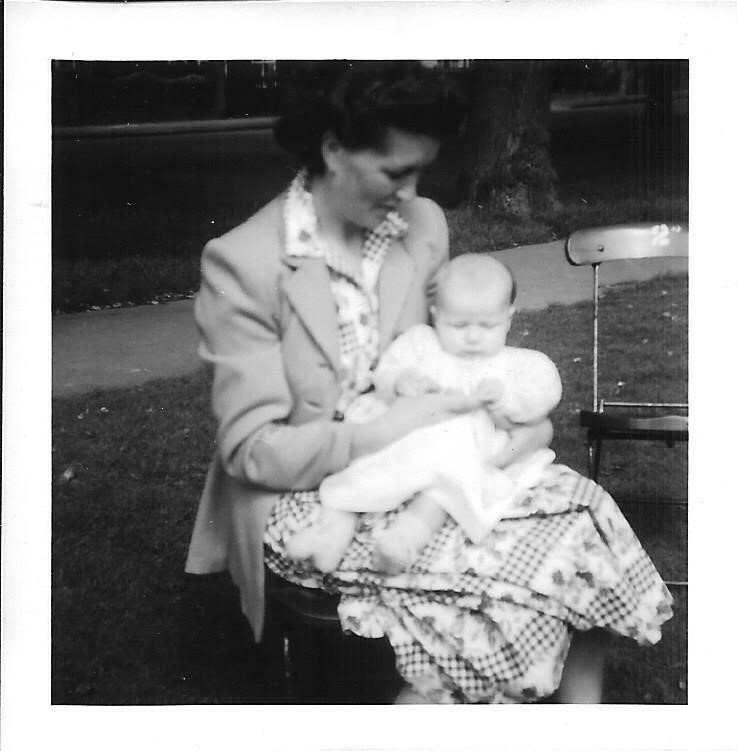 Today is Mother’s Day, and it makes me look backwards and forwards at the same time as I think of my mother, as well as my own children and being so thankful for them. 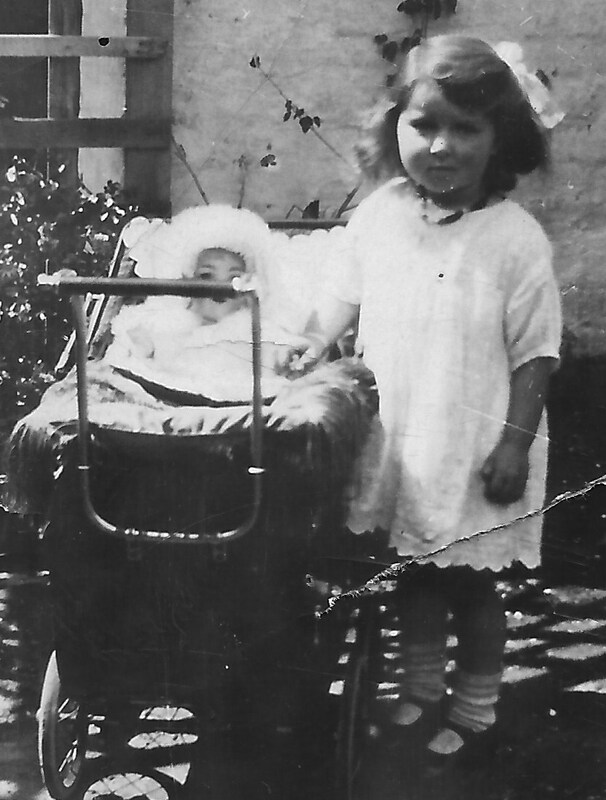 I got out some old photographs of my mother and realised how much she looked like her own mother when they were both children. What do you think? Looking at these two photographs I see such a similarity between the two of them. And even when they were older, the likeness remained. 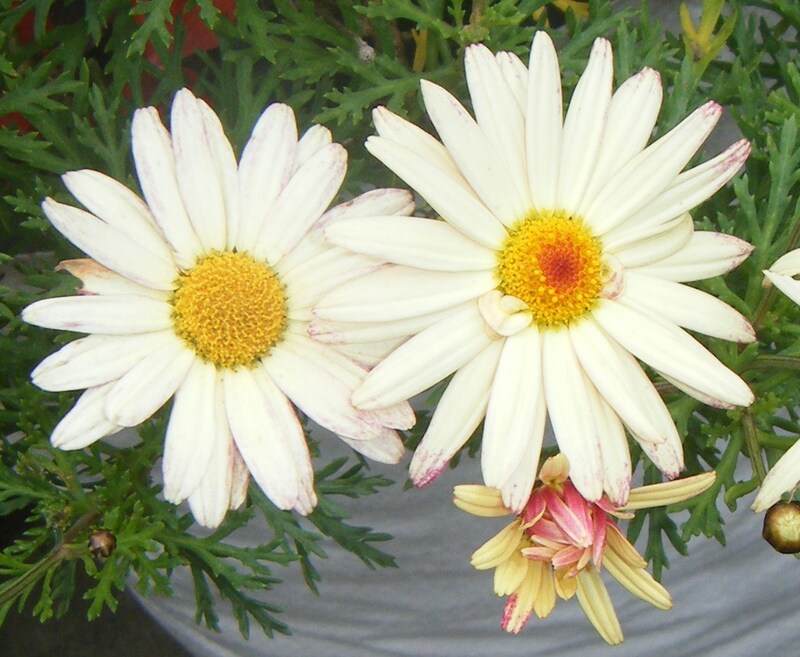 So, today I remember my mother, and her mother and send love to them both. 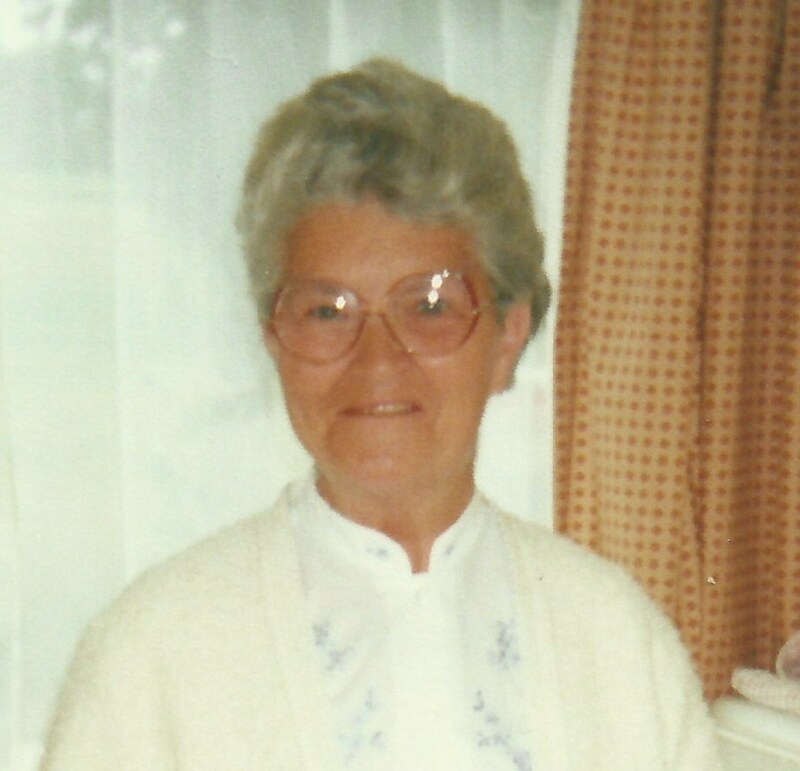 In two days time it will be the anniversary of my mother’s birth, on March the 8th 1927, and I wish to remember that today, also. Sheila is on the far left. I am third left standing, right. 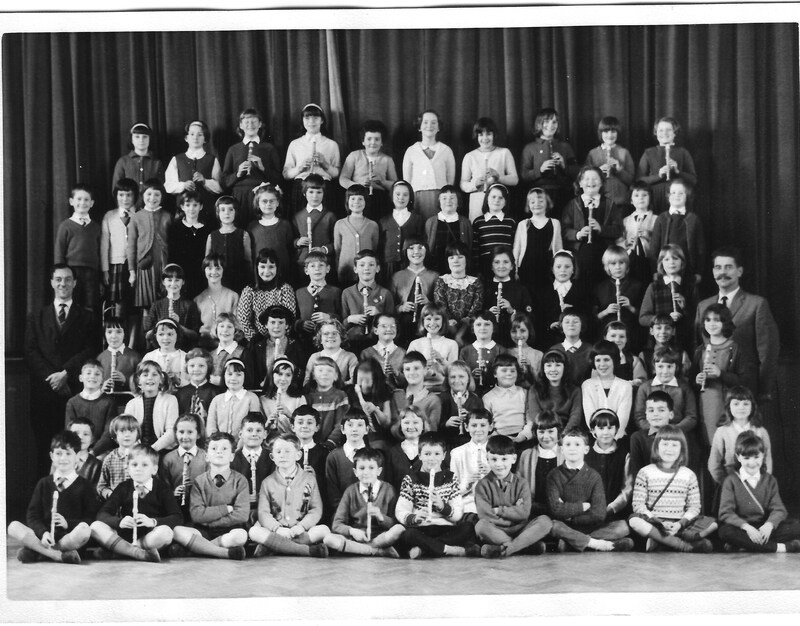 You can see me seated on the front row, second right. 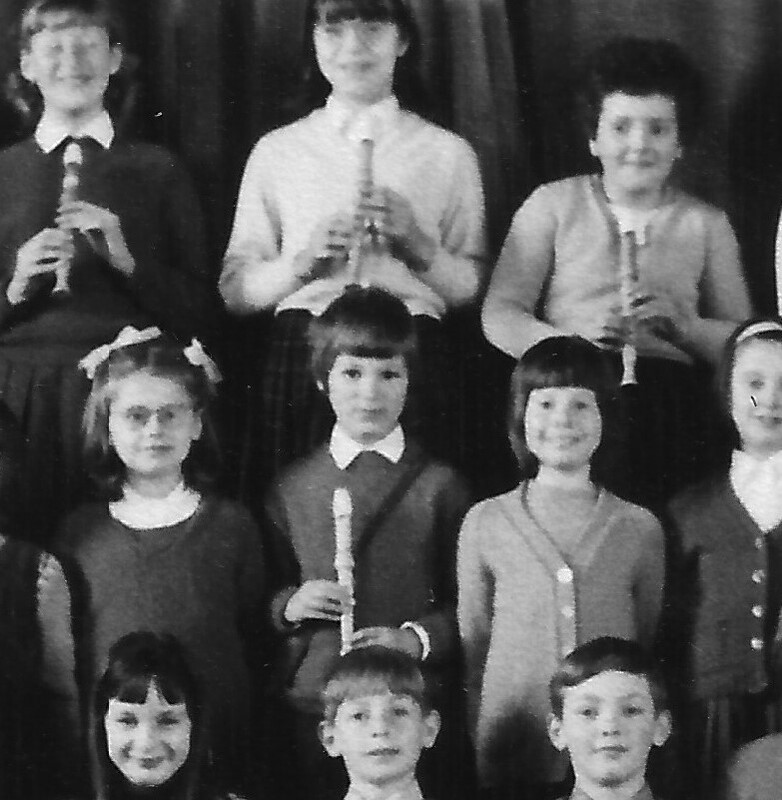 And we can see Sheila in the row second from the back, seventh from left, holding her recorder. She is in between Jennifer Williams and Carole Crossley. 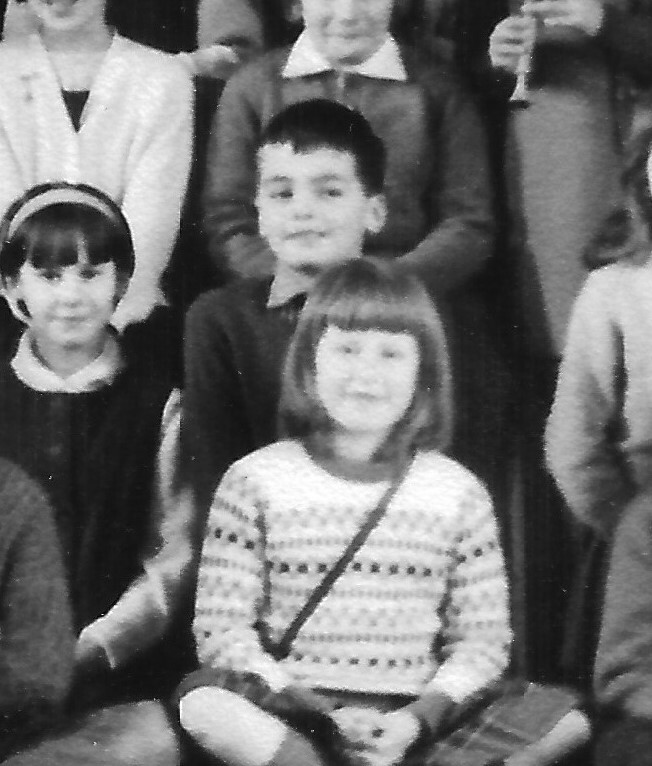 I clearly remember Sheila as a lovely girl, I went to one of her birthday parties which I really enjoyed. 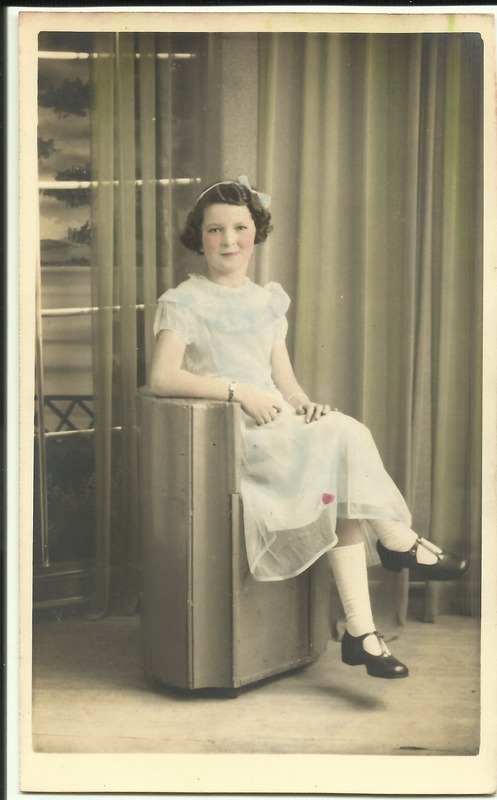 She had older sisters, or at least one older sister, which made a great impression on me at that age. So, I would love to say a ‘hello’ to Sheila, and I would love to hear from you again. Hello 🙂 I’m back! I don’t know about you, but I would have thought spending a few hundred pounds on an item would mean you should be really happy with it, and excited and pleased with your purchase. My old computer more or less died before Christmas, it was only eight years old which seemed so young? Apparently not. So I bought this shiny new one in the January sales. I don’t get on with ‘change’ very well. My son got it out of the box for me, switched it on and handed it to me up and running. I managed to download most of what I needed … Microsoft office (Word) … I’m still in the process of moving my photograph files and document files. By the time I finish no doubt this new laptop will be out of date and I’ll need another new one. 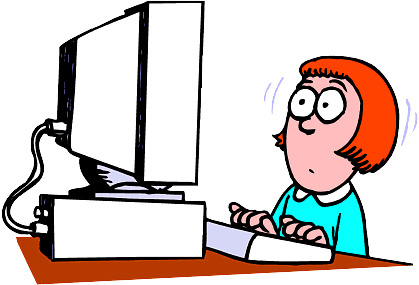 The one thing I really wanted was to be able to log into my blog here at WordPress. And it was the one thing that proved the most difficult. I could have asked my son, but I thought at my age I ought to be able to manage my own computer ‘stuff’. I kept going round in a loop of sending ‘help’ messages for a new password, unable to contact a real person. I got very fed up. However, after many days searching through my trashed email files I found the one from several years ago, with the transaction i.d. that I needed in order to get through to an actual person on WordPress. Then I had to sort myself out a new email address for this login. Finally, this morning …. I was able to log in! I can’t tell you how excited I was! It’s so good to be back! I’m still a little worried I might just disappear again, but hopefully I’ve got it sorted. I will be back to blogging properly over the weekend. The moral of this story is: Keep going and never give up! You will amaze yourself when you discover what you can do. Magnification according to the Collins Dictionary is “the act of magnifying or the state of being magnified” and I have found that this can be improved by using a magnifying glass, rather than using the ‘zoom’ on the computer. For a while now several people have recommended that I buy myself a magnifying glass, and yesterday I did just that! Using the zoom produces a blurred image on my screen, but my magnifying glass gives a clearer picture of what I want to look at. 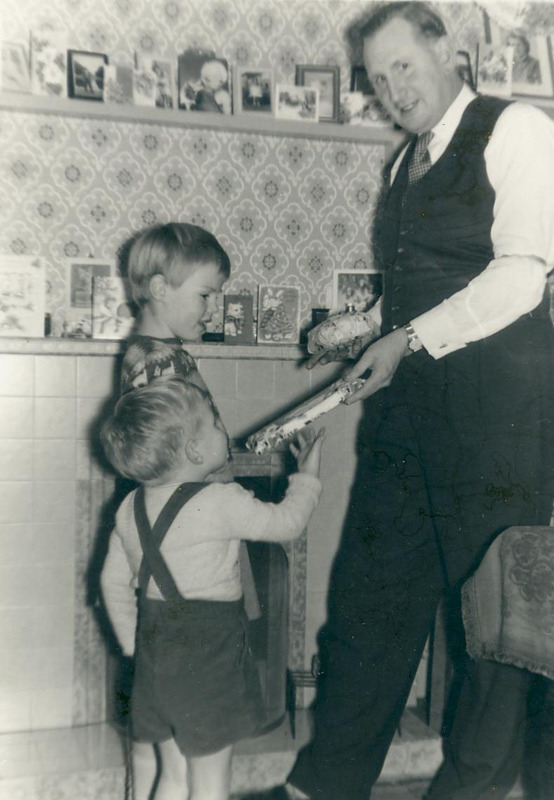 I can’t tell you how excited I was to see this image, sent to me from my cousin Sue, she is the girl pictured with her younger brother, Ian and their Uncle Jack. 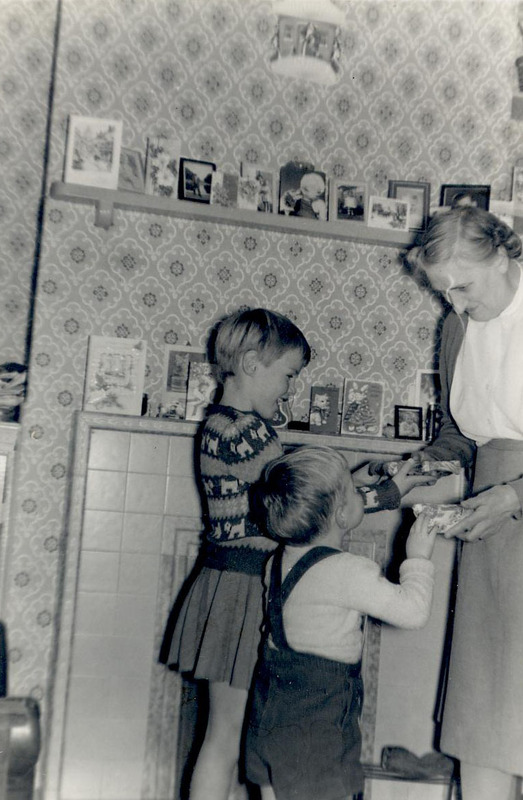 It is Christmas Eve, the 24th December 1959 and it is inside the house of our grandmother, Annie Cleeve/Dinnis. I wished I had been here, and then I used my new magnifying glass to focus in on the shelf just to the left of Jack’s head. The photo in the dark shaded frame looks like it could be me! It means a lot to me to see myself on the shelf of my grandmother’s home. 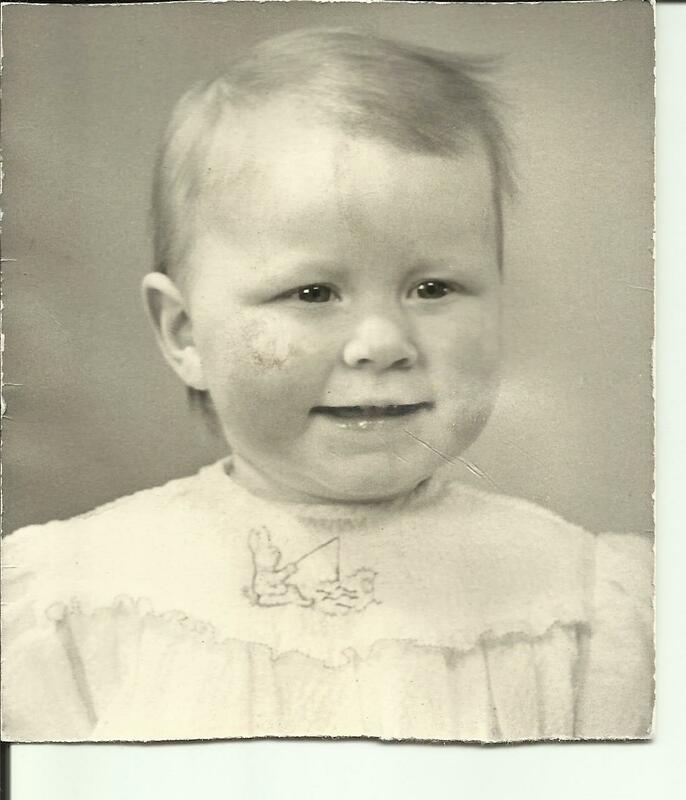 And at Christmas in 1959 I would have been about 18 months old, so the photo would have been fairly new! I know there was a whole series of prints of me at that age, but I only have one. The picture (above) is blurred and I know you can’t tell that it’s me. 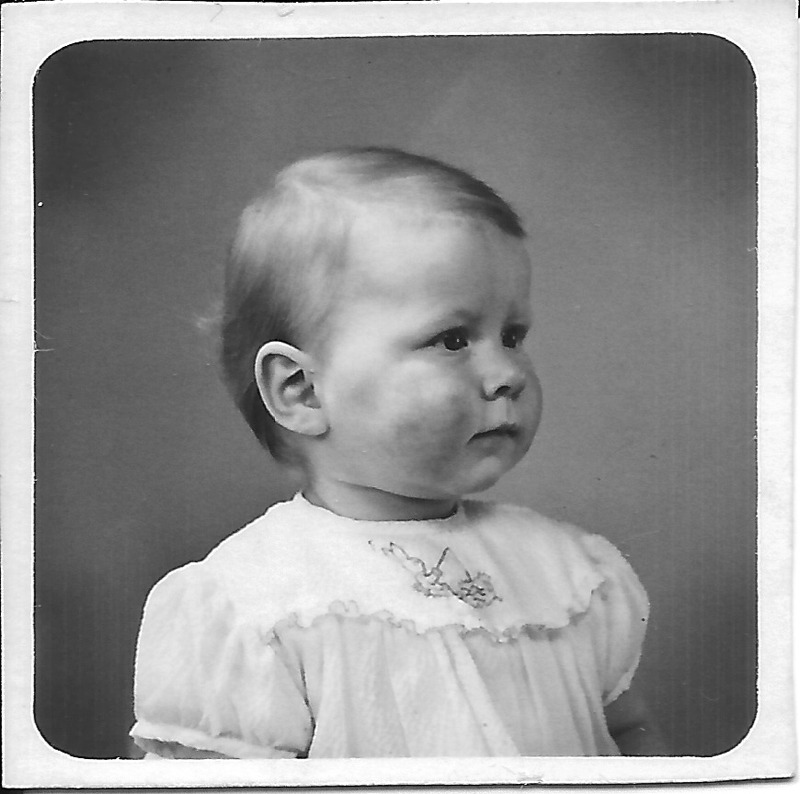 But when I look with my new magnifying glass, it does really resemble me as this little baby. I know I shall enjoy looking at my old photographs with my new magnifying glass! I filed it on my computer under ‘random unknown’, which isn’t strictly true because on the back is written ‘Reg Chapman, Blaker Street’. When putting Reg in this box I just meant that I didn’t personally know who he was! I have since felt bad about labelling Reg as “random” and “unknown” and thought I would try to find out more about him. 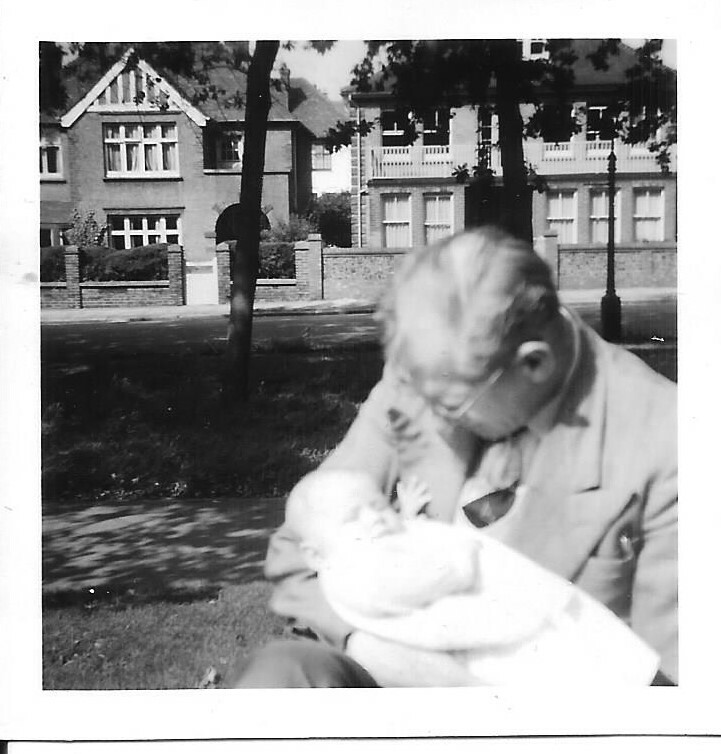 I know that Blaker Street, Brighton is where my grandparents were living from the mid 1930s and where Joseph Taylor and Annie Dinnis brought up their four children: Jack, Nancy, Gordon (my father) and Ron. 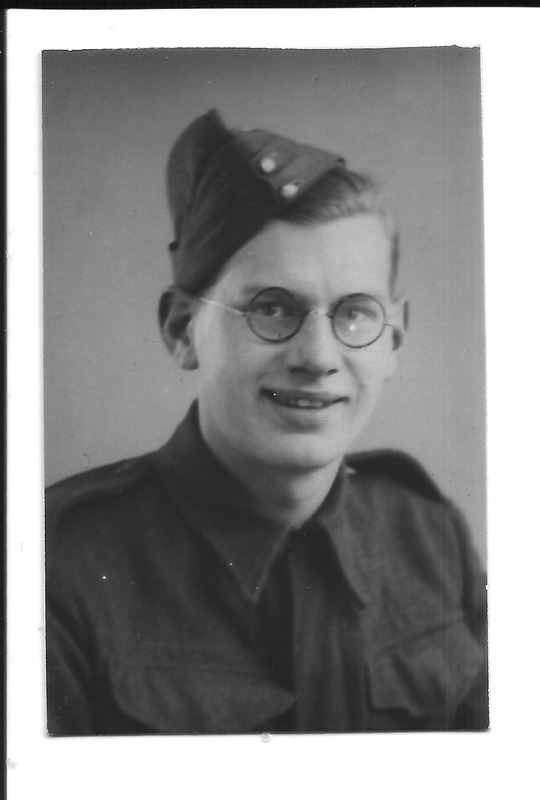 Reg is in uniform, so it would seem to be sometime around World War 2. I checked on the website ‘my house my street’ http://www.mhms.org.uk and checked Kellys Directory for 1947 which is the nearest date available for Blaker Street that mentions the Chapman family. At 38 Blaker Street ‘Dinnis, Joseph’ is listed, and at 42 Blaker Street, two doors down ‘Ernest Frederick Chapman’ is listed. I assume Reg was his son, but that is only an assumption, I have no proof! 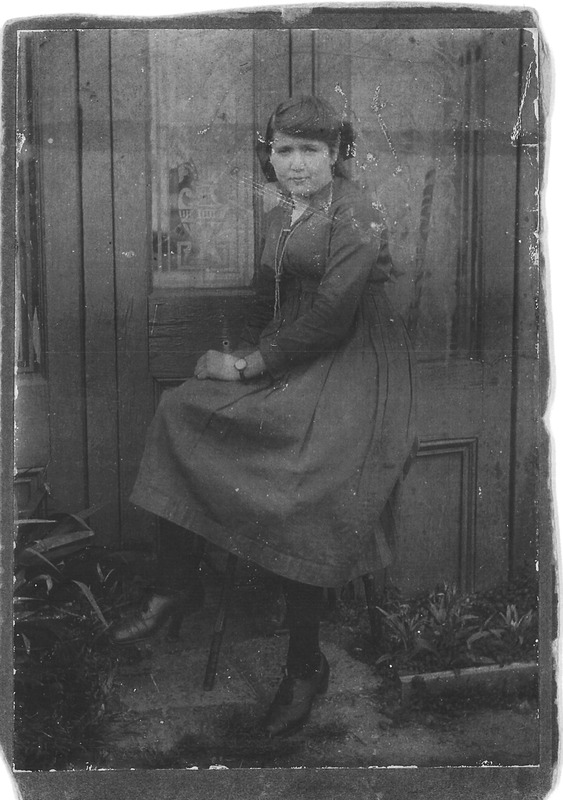 It just seems to me that if my grandmother had a photograph of Reg Chapman in her collection he must have meant something to her. 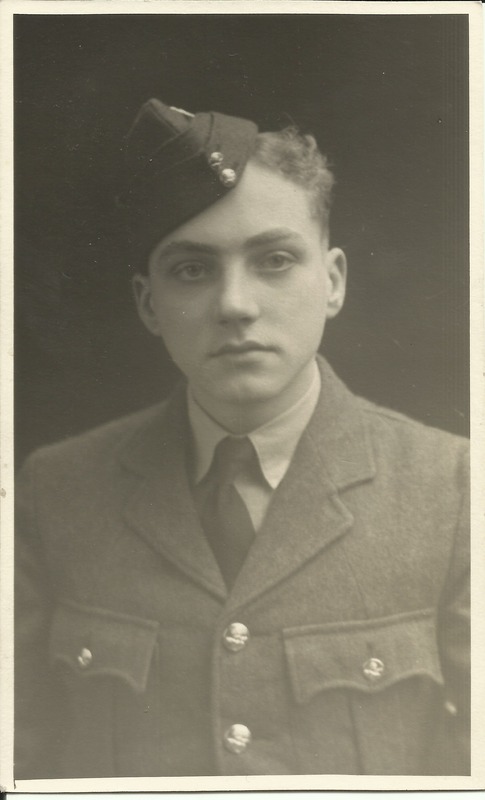 He would have been about the age of her own children, who were also playing their part in WW2 so perhaps the mothers were friends and used to talk to one another and chat about the letters they were receiving from their children. 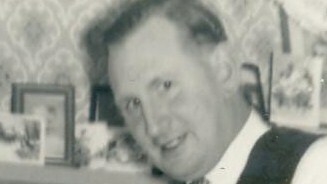 Here is a photograph of my father, Gordon Charles Dinnis. Taken in March 1943 the hat he is wearing looks the same as the one Reg is wearing, although Reg is wearing a shirt and tie. 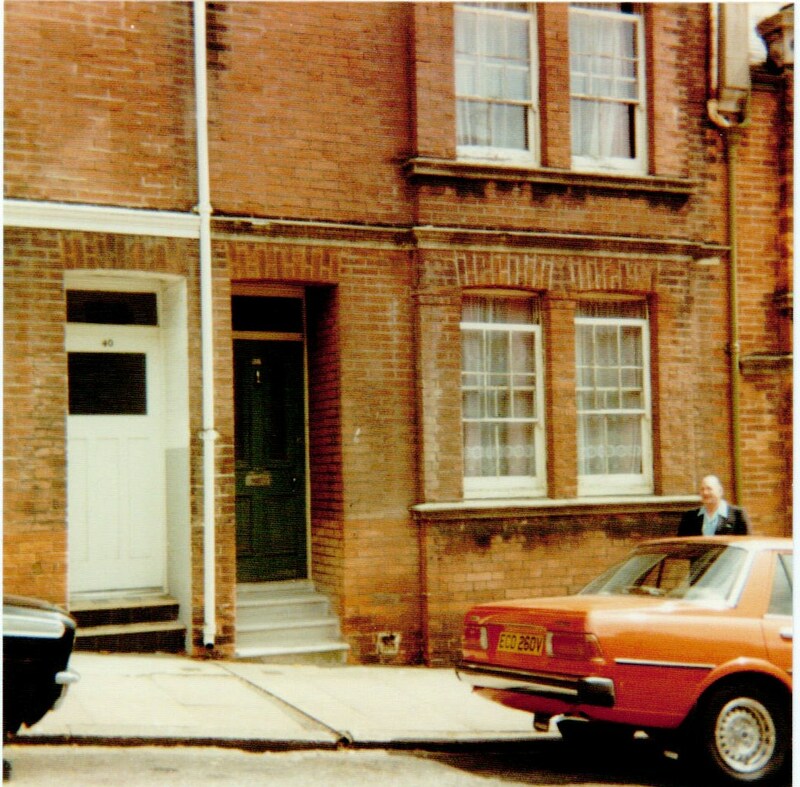 Here is a photograph of 38 Blaker Street, Brighton taken in 1982. It takes you back to 1940 and the bombing of Blaker Street. If anyone has any information about Reg Chapman, I would love to hear from you. 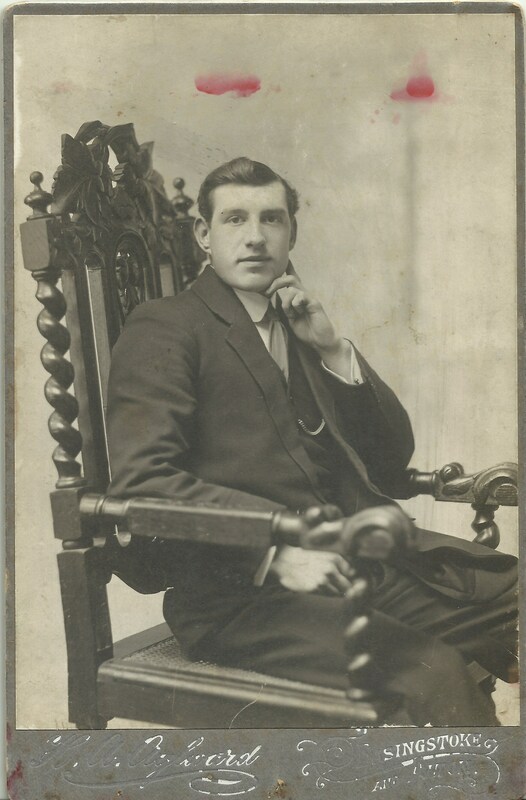 Joseph Taylor Dinnis (my grandfather) celebrated his 21st birthday on November 29th 1913. In those days the 21st birthday was the coming of age, now it’s the 18th birthday that is the main celebration. Joseph was given a very special present from his mother, Catherine Taylor. It was a silver vesta case. 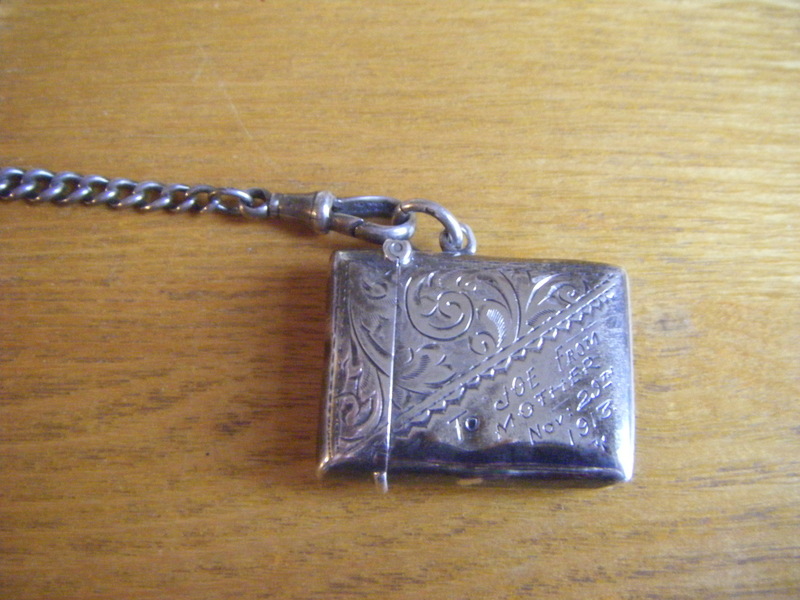 Made of silver, the lid flips open and you keep matches in the little case. 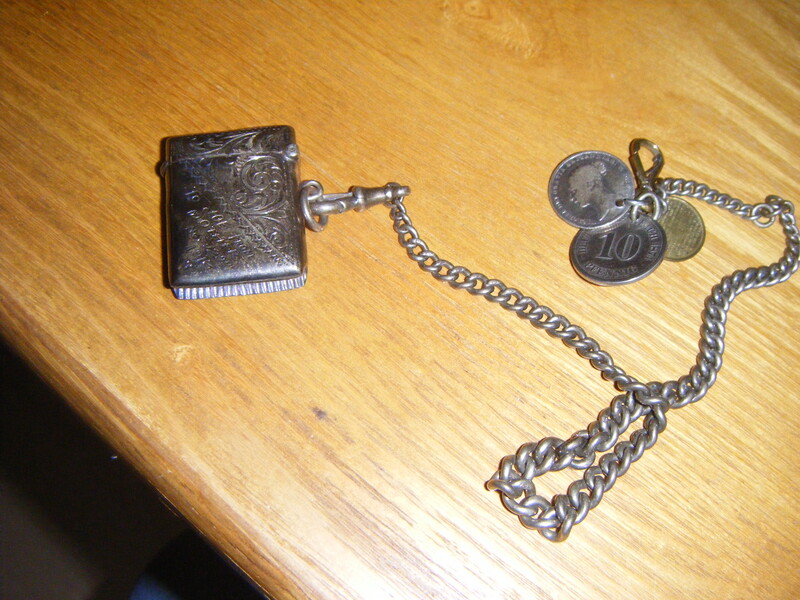 Joseph’s one is very special, it has a wonderful silver chain and three attached coins to it. 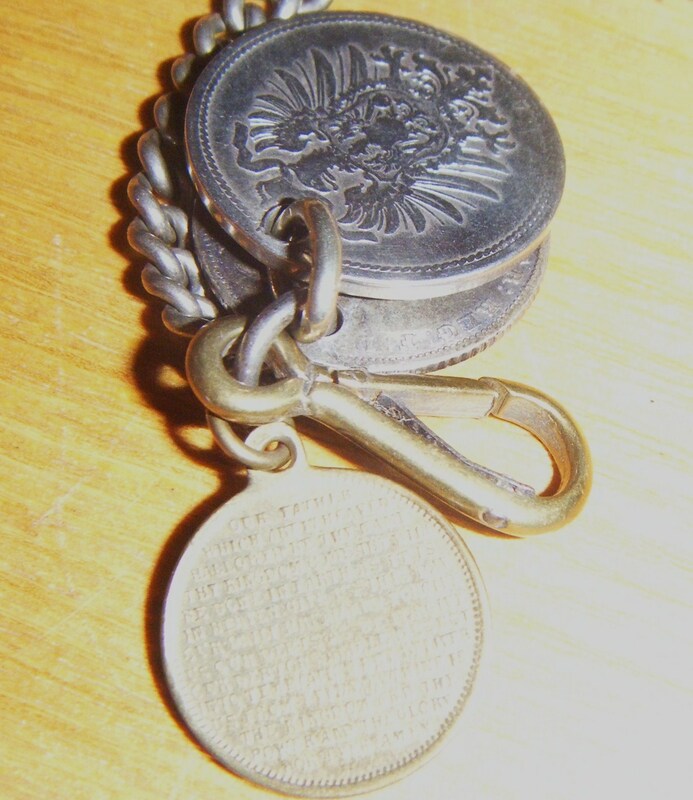 One is a silver sixpence, and one is inscribed with The Lord’s Prayer. It’s not the best photo, but you can sort of make out the writing! 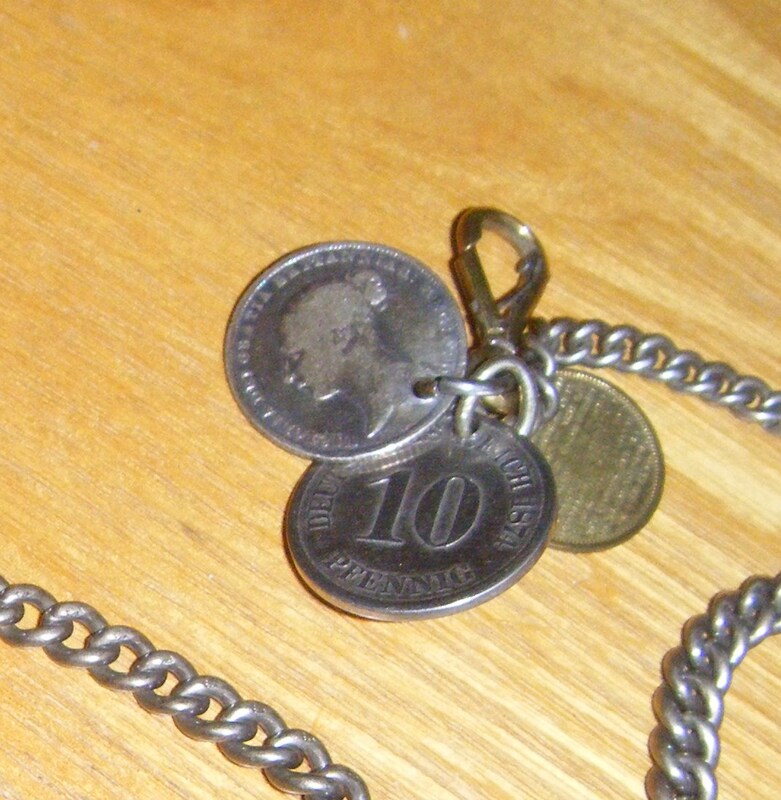 “Our Father which art in Heaven, Hallowed be Thy name …” The other attachment is a 10 pfennig coin. The main vesta case is inscribed ‘To Joe From Mother November 29th 1913’. 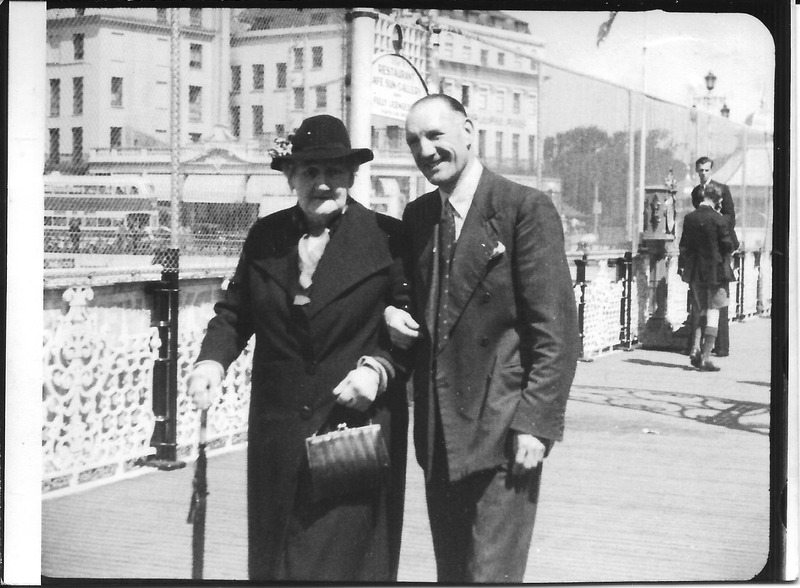 His mother was Catherine Taylor, here they are together on June 4th 1939, in Brighton. 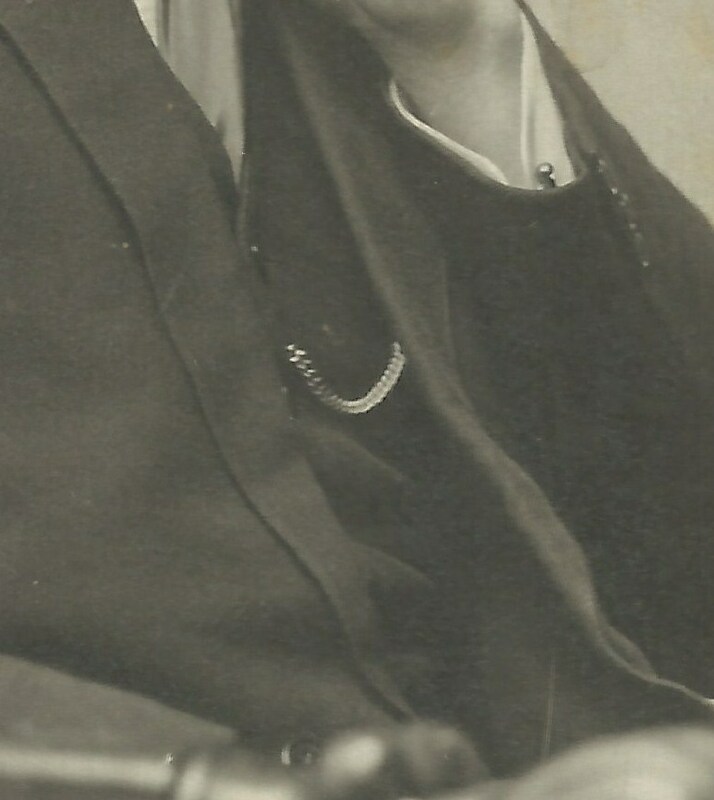 And here is Joseph (Joe) on the 23rd March 1914. We can see a chain, and I wonder if it is the one given to him by his mother a few months previously and connected to his vesta case. Vesta Cases were small portable boxes with snap shut covers to contain short matches and keep them dry. Many thanks to my cousin Sue for bringing over the vesta case and sharing it with me.